is an associate professor in history at the University of California San Diego. She is the author of A World of Homeowners: American Power and the Politics of Housing Aid (2015). Tokyo, London, New York, Paris, Manila. Few would think of Manila atop a list of the 21st century’s premiere cities. Nor would most think of the Philippine capital as a critical node in the global economy. Yet Manila is indisputably at the centre of some of the most important urban trends of the past half-century: it is the world’s most densely populated city, and continues to grow at an exponential pace. It serves as the headquarters to one of the fastest growing economies in the world (10th in 2017, according to the World Bank). Filipinos, especially residents of Manila, travel all over the world as nurses, nannies, construction workers and sailors. They provide the mass labour fuelling the global service economy. In our urbanising world, Manila, and a few other rapidly growing world cities, are not only just helpful in understanding how global cities work; they are indispensable. Manila has long served as a hub connecting regional, colonial and global economies. The city sits on the coast of Manila Bay at the mouth of the Pasig River; it is low-lying, fairly flat in topography, and woven through with estuaries. Not surprising given seasonal monsoons and tropical cyclones, Manilans often have to cope with devastating floods. The most striking aspect of life in Manila, however, lies not in physical attributes but rather in the legal status of the communities living above and around these waterways. For the residents of this city of nearly 2 million, ‘informality’ is an all-encompassing, defining feature of everyday life in the capital. The term ‘informality’ is sometimes conceptualised as a periphery or a place of exclusion, but it is more accurate to define it simply as an absence of government control, management, or knowledge over an area. A city can be predominantly informal with lively black markets and mostly unregulated labour and housing. Informality does not have to occur on the margins of everyday life. In Manila, informality is both ubiquitous and poorly understood; statistics are widely varying and erratically collected. 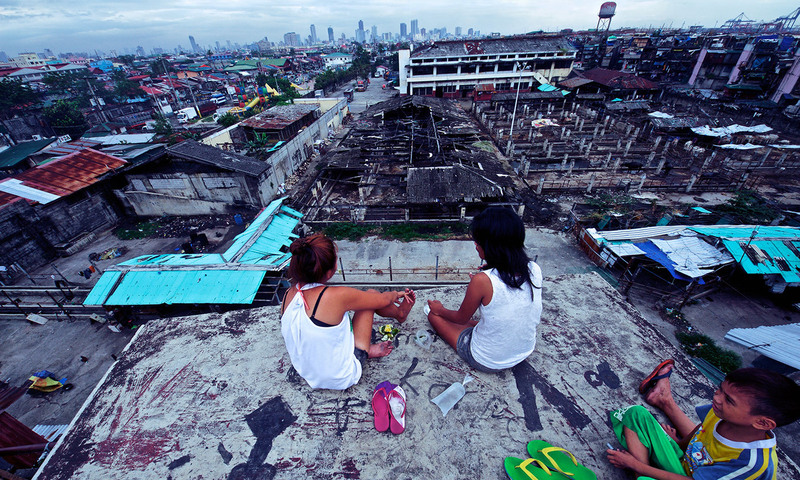 The government estimated in 2010 that roughly one in five residents of Metro Manila lived in housing about which the government kept few records and over which it had little authority. The number has most likely grown. The Rockefeller Foundation’s current Informal City project offers some estimates. According to a recent report, 40 to 80 per cent of Filipino residents work in the informal economy. Meanwhile, informal settlements are everywhere apparent, with self-built structures lining the waterways and filling nearly every available space in the city, and with informal settlers working in seemingly every aspect of the urban economy. Even a casual look at Manila, and other bourgeoning global cities, shows that the functioning of the urban economy depends on informality. Informality allows workers to subsist on marginal incomes. Informality provides homes where the formal market does not. Despite or perhaps because of their meagre pay, these workers’ role in the global service economy is anything but marginal. A shoe repairman sets up a roadside station where he fixes the shoes of the restaurant worker who in turn serves food to visiting investors and local businesspeople. Workers rest in informal settlements before getting up to drive the jeepneys that transport young men and women inexpensively to Makati’s call centres. There, they will answer questions and complaints from customers of global firms headquartered in New York, London, and more. All for a low wage. Informality provides the foundation for local and global profits. Manila helps us to understand how informality grew into a prevalent way of life in some cities, and an integral component of the global economy. In 1945, at the end of the Second World War, poor rural migrants flooded into Manila, in search of work and food. For these desperate newcomers, land-use rights mattered much more than land titles. Rural migrants built their own shelter on unoccupied land in the city, whether along railroad tracks, extending on stilts over waterways, or under bridges, and they constructed a sense of ownership that included the right to lease and sublease their units. Many ultimately set up their homes near or on Manila Bay in the northern district of Tondo – a community of some 180,000 residents by the early 1970s. Residents did not deny the lack of government recognition for their land rights. Nonetheless, they still felt a sense of ownership, as evidenced in Zone One Tondo Organization’s explanation for resident motives when staying in unserviced homes in 1973: ‘the people prefer to live in a very small barung-barong [shanty] that is their own rather than rent a place’. The former president Ferdinand Marcos understood informality. He understood migrants’ claims to property rights; in fact, he tried to neutralise the political power of Tondo residents by defining informality in opposition to formal, state-regulated spaces. In 1975, Marcos issued a presidential decree criminalising ‘squatters’ and ‘squatting’ as a ‘nefarious’ action punishable by incarceration and/or fines. In this way, the Philippine government implemented a clear legal dichotomy – formal versus informal, legitimate versus squatting. It did so in an attempt to strengthen the power of the state while undermining the political power of poor people who might oppose the ruling class. Put simply, the state created informality. The Philippine government is not unique in building a divide between formal and informal. Governments around the world do likewise, and for reasons historical and political. International advisors in United Nations technical assistance missions and US foreign-aid programmes advise Kenya, South Africa, Thailand, Peru, the Philippines and other so-called ‘developing’ countries to do so. These well-meaning technocrats, planners, housing experts and international development experts often find the manner and pace of urbanisation in these cities unruly and confusing. So they urge national governments to foster order by adopting or reinstituting vigorous land surveying and titling programmes. If individuals owned land, that land would become property – a site of investment and a potential source of profit. Regularised records would facilitate global investment. To Western development specialists, this is order, progress, modernity.